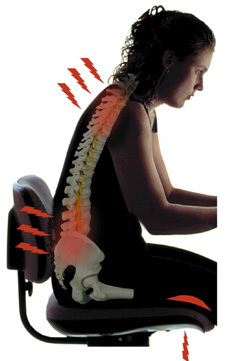 If you experience pain when sitting, you are one of the millions worldwide who are similarly burdened. According to the National Institute of Arthritis and Musculoskeletal and Skin Diseases, 8 out of 10 people suffer from general back pain over their lives. The number who specifically suffer from pain when sitting is also very high, and growing amongst people who sit for long periods due to their lifestyle and / or work. A constant stream of research is being published that clearly links the length of time spent sitting with health. Anything over 4 hours per day is shown to be damaging. Kansas State University researcher, Richard Rosenkranz, (summarised here on ScienceDaily.com) has reviewed data from over 60 000 Australian men that shows those sitting for more than 4 hours were significantly more likely to report having a chronic disease such as cancer, diabetes, heart disease, or high blood pressure. The risk periods were categorized as less than four hours, four to six hours, six to eight hours, or more than eight hours. Perhaps unsurprisingly, there was a direct link between the length of time spent sitting and ill health. The link between time spent in a chair and pain when sitting, is also being clearly mapped. Researchers postulate that the lack of movement involved in sitting for extended periods induces conditions in our body that inevitably lead to back pain and dysfunction. Here is a link to an interesting article by Paul Ingraham that discusses the changes that occur to our backs over time. It is becoming obvious that healthy backs are mobile backs and that lifestyle changes need to be made if you want to avoid pain over time. There are many different ways that a damaged back shows its presence and almost all of them involve back pain of one sort or another. A general diagnosis of “lumbago” or “axial pain” is not very helpful, and has very limited impact on any possible treatment. Other types of pain are more clearly related to one particular area, for example an injury to the coccyx ( tail bone ). What is clear, is that the longer you sit, the more you aggravate an injury and / or crucially, set yourself up for one. 1. Sit less! Even in a work situation where you are required to spend hours in front of a computer screen, or on the telephone, there are options. Some offices now include standing desks that allow workers to spend at least some of the day out of a chair. 2. Sit differently. There are any number of different options for types of chairs. Kneeling chairs, firm chairs, orthopaedic chairs – the list is long and those that help align your sitting posture are obviously the best. 3. Sit actively. The real problem with prolonged periods of sitting is that you are static and constricted. If you sit in the same position for too long, all of your body systems are forced to stay immobile and with that comes muscle weakness, circulatory problems, and compression of your spine. Active sitting involves changing your position frequently. You can do this by having more than one chair, sitting on a swiss ball, or simply changing how you far forward or back you sit. All of these methods active your core muscles to keep your body strong and mobile. This Spine Health article gives some other alternatives. 4. Sitting aides. If you have to sit for prolonged periods, it may be worth investigating some of the better postural support products that both train you into using better sitting posture and ensure that your core muscles remain strong. Two that are worth considering are the LUMO Lift (an electronic posture trainer) and the BackJoy a simple dynamic seat improver.